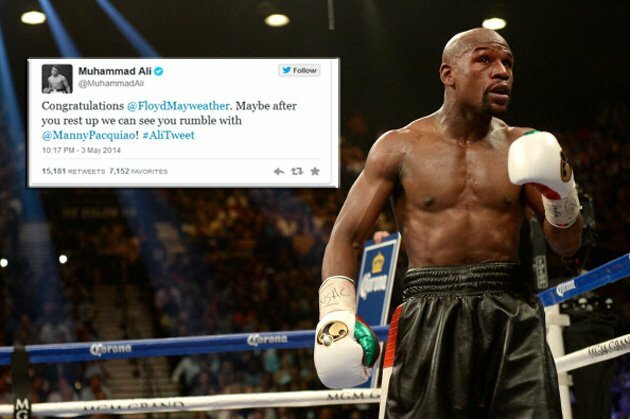 Considered “The Greatest of all Time”, Muhammad Ali has sent a tweet to Floyd Mayweather congratulating the self-proclaimed “Best Ever” on his controversial win over Marcos Maidana on Saturday night at the MGM Grand. Floyd got the majority decision on points against Marcos Maidana to maintain his unbeaten record and Ali has said that the current pound-for-pound kings Floyd Mayweather Jr. and Manny Pacquiao should just face each other in the ring. Mayweather survived an epic encounter with Maidana, pushing him hard all the way. Mayweather’s majority decision over Maidana was closer than what the scorecards 114-114, 117-111, 116-112 suggest. This fight came as Floyd’s toughest test to date. The 37-year-old retained his WBC welterweight title and added the WBA crown to his collection as well as he improved his professional record to a flawless 46-0. With Ali asking Floyd to fight Pacquiao, this is someone Floyd might listen to. According to the profile of @MuhammadAli, which is a verified account, any tweets with the hashtag #AliTweet originated from The Champ himself. Although Ali didn’t reveal why he thinks the fight should take place, he probably agrees with the boxing public that they need to fight before they both retire. For a long time, Golden Boy Promotions who promotes Floyd and Top Rank who promote Manny have both been feuding. The main problem lies with Richard Schaefer not being remotely interested in working with Bob Arum. Should the feud be put behind them and both camps agree to terms, the fight could be the cards. Over the weekend Golden Boy’s Oscar Dela Hoya met with Top Rank’s Bob Arum to offer an olive branch in hopes of getting over their feud so fights can be held between the two promotional companies. This is at least a step in the right direction. Should the feud be buried, the super-fight will be considerably easier to negotiate. Fans of Pacquiao and Mayweather have grown tired of the super-fight not being made. Many believe that it is a travesty that both camps cannot agree terms with the continuing feud. This fight needs to happen. The boxing public will have been robbed if we never see the two top pound-4-pound champions meet in the ring. For the good of boxing this fight needs to happen.